Buy 10 washes, get one free! Receive A Free $10 Wash Card In The Mail! For first time customers only. One per household. You're Going to Love Doing Laundry With Us! Built in 2011, Vancouver Laundromat is proud to be the area's newest and most modern laundry facility. Our state of the art, spacious facility offers the largest capacity commercial-grade washers and dryers in town. Conveniently located in Orchards Plaza, we offer many amenities that will make doing laundry a breeze! "Wonder how much laundry you can clean in one of our eight-load washers? 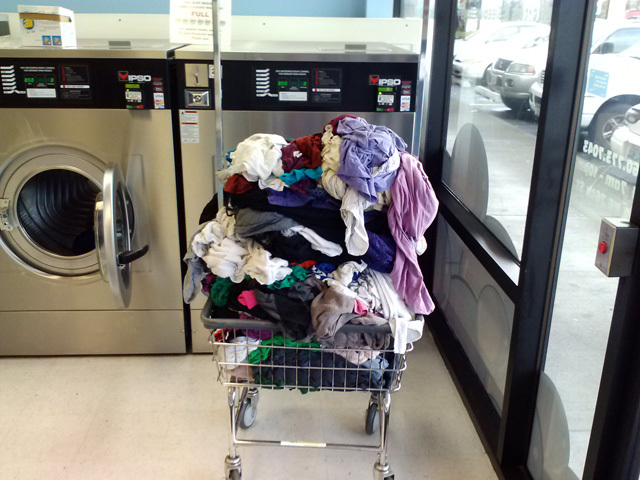 Here is an example of a freshly-washed load from one eight-load washer!" "Vancouver Laundromat is probably the baddest laundromat on the planet. Every time I'm in town I take my clothes over there. Clean." "I live in an apartment with a laundry room, but I prefer to go to Vancouver Laundromat. It is always clean and brightly lit. I like the free WiFi too. The owner is friendly and takes pride in his business."